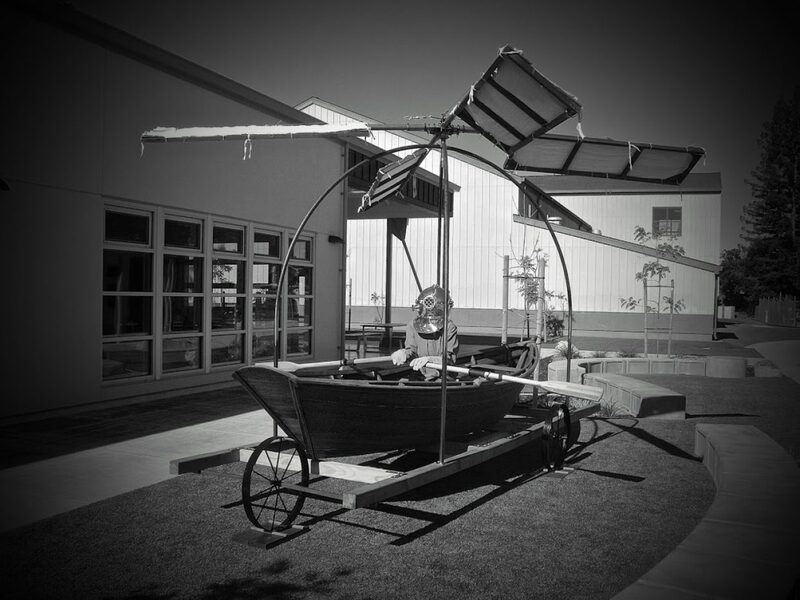 Dada@Sea will be an interactive floating installation created by Linus Lancaster and Frederick Young with the assistance of art students from Healdsburg High School, University of California Merced, and the San Francisco Art Institute. The structure is comprised of floating and land-based galleries, sculptures, radio transmitters, and Wilhelm Reich’s Orgone accumulators. Its location is as virtual as it is literal. Its objective is a critique of Twenty First Century consumer culture, the Silicon Valley Tech industry, and the effects of capitalism on human and animal conditions. Throughout the course of the Dada World Fair the Dada@Sea project will host several events upon the high seas. The installation will incorporate and reinscribe a radio station (from a previous installation entitled Radio Free Benjamin http://www.hauntedreflections.net/) to be built mostly with hay bales, in reference to the Bay’s early sailing barges such as the Alma (https://en.wikipedia.org/wiki/Alma_(1891)). It will also function as a display space for a variety of sculptural, hand-built radios. Additionally the project will include a 16′ Banks dory from the SF Maritime Museum’s Boat Building Education Program (http://maritime.org/edu/youthboat.htm), which will be finished by HHS students and converted to a Dada-esque vehicle. The third component is planned as an installation on the Farallon Islands west of San Francisco, and the Marconi Marine Radio Station in Point Reyes, California. Dada at Sea is being hosted at The San Francisco Sea Scout Base, located at the foot of Van Ness Avenue in Aquatic Park. Just a short walk from Fisherman’s Wharf and Ghirardelli Square, the base is right in the center of San Francisco’s lively waterfront. If you are traveling to the base on Muni, the 30, 47, and 49 lines go straight to Van Ness and North Point, and from there you walk down the hill until you reach the boathouse right before the municipal pier at 3500 Van Ness Ave. If you’re driving, there’s usually parking on Van Ness Avenue. Visit http://corsair-viking.org/map/ for more information.